A dizzying mix of fresh and aromatic notes. The latest in elegant and seductive fragrances. Colors de Benetton Blue is relaxing and refreshing citrusy fragrance with top notes of bitter orange, lemon and yuzu leading to the heart of orange blossom, freesia and a mate accord. The base notes include cedar wood, tonka bean and musk. 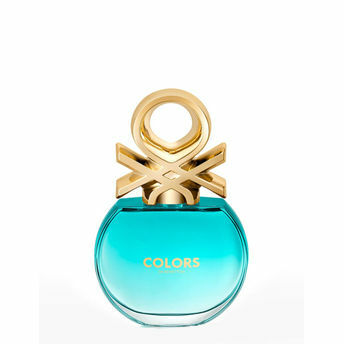 United Colors of Benetton presents its new feminine fragrance collection Colors, derived from the brand’s very DNA: color. Feminine, delicate, iconic - these feminine perfumes, in blue, pink and purple, convey values such as diversity, multiculturalism, beauty, and optimism. Through its latest launch, the Italian brand offers a new way of looking at the world via a diverse, positive palette of colors. Explore the entire range of Perfumes (EDT & EDP) available on Nykaa. Shop more United Colors Of Benetton products here.You can browse through the complete world of United Colors Of Benetton Perfumes (EDT & EDP) .Alternatively, you can also find many more products from the United Colors of Benetton Colors De Benetton Blue Eau de Toilette range.